1-CD with 28-page booklet, 33 tracks. Playing time approx. 75 mns. 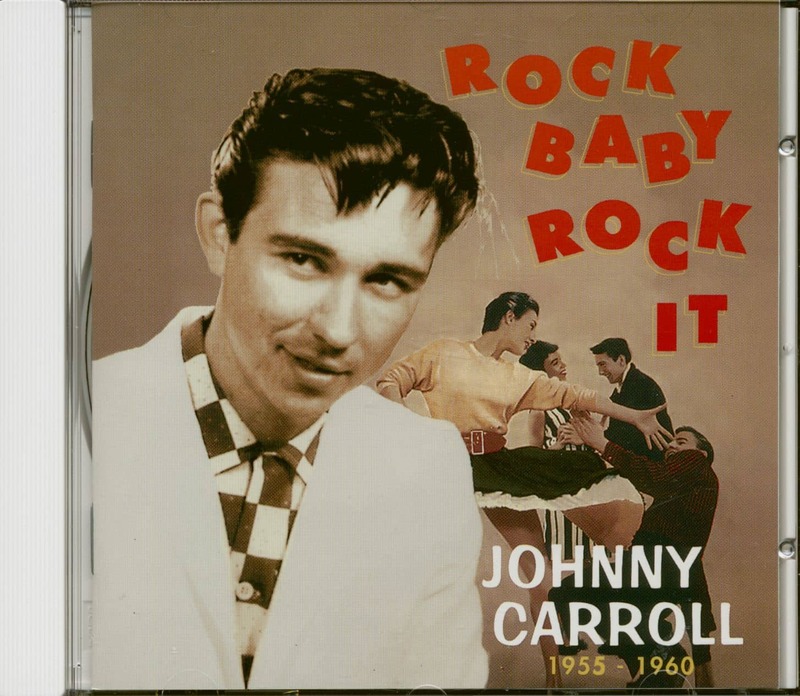 Back in the 1950s, Johnny Carroll was one of the wildest of them all. For fans of explosive, no-holds-barred rockabilly, this is a dream collection. It includes all of Johnny's recordings from 1955 to 1960. All the early, garagey Dallas cuts are here, the classic Sun and Decca sides, more from Dallas, and four songs for the legendary sub-B movie, 'Rock Baby, Rock It'. Tracks include: That's The Way I Love, Hot Rock, Wild Wild Women, Crazy Crazy Lovin', Tryin' To Get To You, Corrine Corrina and Rock And Roll Ruby. John Lewis Carrell was his real name, and not Johnny or even Carroll which was a Decca mis-spelling he failed to correct. He was born on October 23, 1937 in Cleburne, Texas and raised in nearby Godley. His father was a schoolteacher, a cattle rancher and a dairy farmer. It didn’t hurt that Johnny’s mother, Ina Mae, came from a long line of musicians, mainly breakdown fiddlers and accordionists. Radio was an early fascination in Carroll’s life; he struggled to catch Roy Acuff, Tex Ritter or Ernest Tubb before the battery faded altogether. Armed with his first acoustic guitar, aged nine or ten, Carroll sang and played on Cleburne’s KCLE on Saturday mornings. Electricity came to Godley in 1947: “From then on we had big, big radios that looked like a jukebox… Blues had such an impact. We were getting it out of New Orleans and on WLAC in Nashville… While I was in high school we were all getting into the Clovers and The Charms. We were basically country people and we still had a hillbilly band. But there was no segregation musically.” Carroll’s high school band, formed in 1952, was called the Texas Moonlighters because of the many nights he and his friends spent milking cows or baling hay. On graduation in 1955, the band included Bill Hennen on piano and Billy Bustin on bass. Lead guitarist Jay Salem from Burleson, Texas was brought in when he came second in a talent contest at which the Moonlighters won first prize. The Moonlighters never made a dime more than subsistence living even though, in Carroll’s words, “we played anyplace we possibly could and just tried to get on stage anywhere we could.” It was at the Northside Coliseum in Fort Worth that Carroll met Ferlin Husky. “Ferlin heard us and he said: ‘I’ll tell you what I’m gonna do. There’s a lot of important people out there. You go out and do the first fifteen minutes of my show.’ And we did, and that’s when this J. G. Tiger came up...” J. G. stood for Jack Goldman, who added a flamboyant but fictional surname to increase his prestige. Johnny thought he was pushy but positive. Tiger took the band, now renamed the Hot Rocks, into Dallas where he had an interest in the Top Ten Recording Studio. Tiger used the tapes they made to pitch to Paul Cohen, Decca’s A&R chief in Nashville. “Tiger called me saying, ‘I’ve got you a deal but the regular boys in the band can’t come to the session.’ We went down and did three tunes and the next day we did three more. They were cut in the basement of a house that belonged to Owen Bradley. The session guys listened to our demos and copied ‘em almost exactly.” The Decca singles were played in the South and the North East. Most of Carroll’s fan mail – enough to fill two suitcases - came from New York or New Jersey, but on a national scale kids paid more attention to ads for pimple cream. The entrepreneurial Goldman decided that a movie would best promote his nineteen year old protégé. 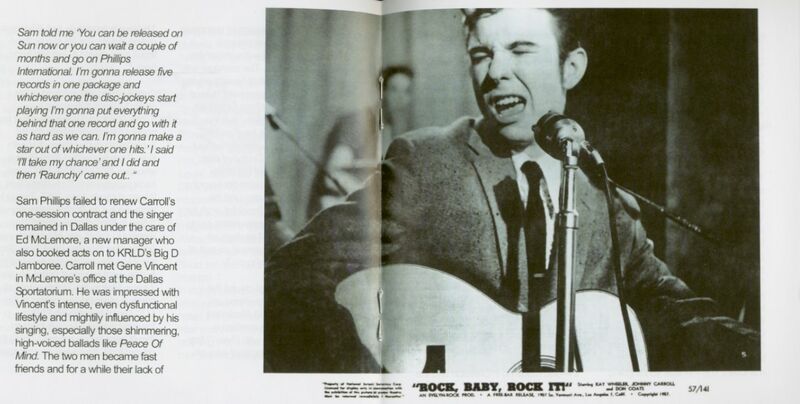 His family financed ‘Rock, Baby, Rock It’, filmed mainly in Dallas, a movie about a group of youngsters who thwart gangsters threatening to evict them from the building in which they run their Hot Rock Club. Filmed in October 1956 and released in the summer of 1957, the musical interest centered on the R&B of the Five Stars and Rosco Gordon. 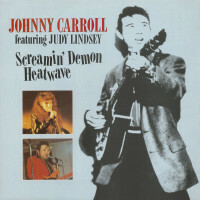 Johnny Carroll and the Hot Rocks injected their own kind of blues – a wild, passionate, thoroughly abrasive music – recorded for the film at Pappy Sellers’ studio in Dallas. The film played in a few venues and was then withdrawn. Carroll continued on stage but he and Goldman parted in acrimonious circumstances when Carroll discovered a Dallas venue had been paying a thousand dollars a night to Goldman, but Johnny had been getting a hundred. Phillips did not renew Carroll’s one-session contract. Johnny stayed in Dallas and worked with Gene Vincent before recording Bandstand Doll and The Swing for Warner Brothers. It sold quite well and became Johnny's biggest seller. He recorded for some minor labels but tired of touring far and wide to get work. “I finally said ‘this is ridiculous’ and quit.” He became a booker and fixer at a Fort Worth nightclub until in the ‘70s Ronny Weiser drew his attention to the rockabilly renaissance and persuaded him to record for Rollin’ Rock. Then he teamed with former beauty queen Judy Lindsey, singing on the Texas country circuit and in Europe. Johnny Carroll died on February 18, 1995 after a liver transplant. 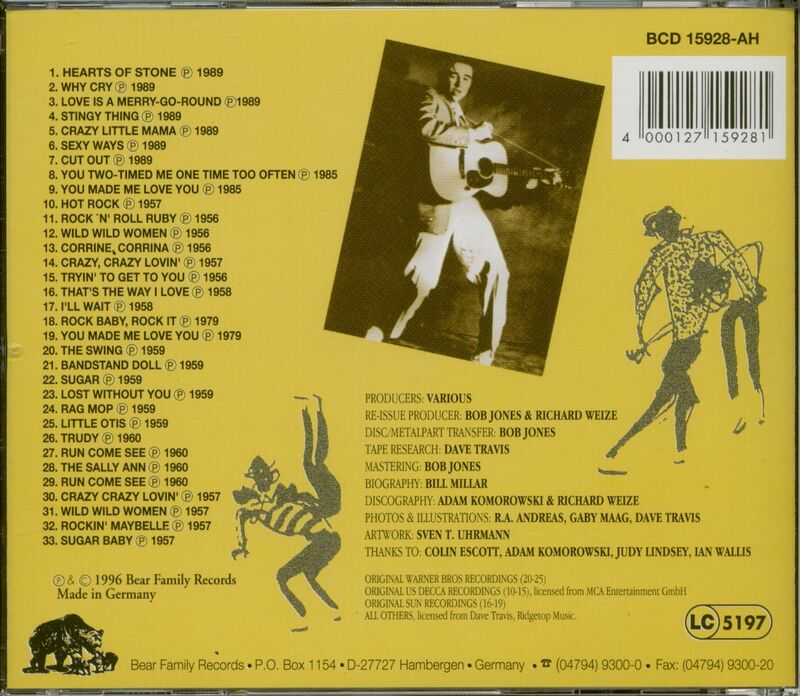 Customer evaluation for "Rock Baby, Rock It (1955-1960)"